Finding spots of red blood in the toilet can lead anyone to assume the worst: cancer. Before you panic, consider the following 10 causes of blood in urine, also known as hematuria. While it can be alarming to discover, blood in urine may be a symptom of a non-life threatening condition. Blood that can be seen with the naked eye is known as gross or visible hematuria. Microscopic hematuria can only be detected by blood tests ordered by your doctor. Both situations call for further testing to discover the cause. Hematuria cannot be directly treated as it is an actual symptom and not a disorder itself. Treatment for blood in urine is targeted at the underlying cause. In some cases, what appears to be blood in urine is simply caused by medications, food dyes, and excessive consumption of beets. Other causes can be linked to the leakage of blood cells into the urine from the kidneys or urinary tract. A little known result of strenuous exercise can be traces of blood in urine. Research has not confirmed the reason, but many athletes, especially runners, experience this symptom. Studies suggest it may be caused by the red blood cells becoming dehydrated or the effects of trauma on your bladder. Bladder and kidney stones are formed by crystals that originate from minerals found in concentrated urine. They are usually painless until they cause a blockage or are passed. Severe pain, frequent urination, and blood in urine are common symptoms of both bladder and kidney stones. When a bacterial infection enters the urethra tract, it can quickly grow inside your bladder. The classic symptoms of pain, burning sensations, and frequent urination may be accompanied by blood in the urine. The blood may be red, pink, or even brown in color. Blood in urine from a urinary tract infection in the elderly can only be detected by a lab test. 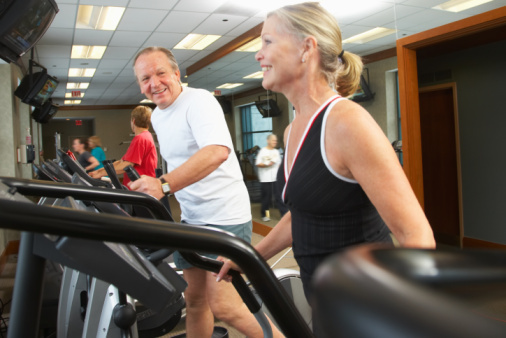 As men age, their prostate gland grows and, in most cases, does not cause any issues. If it begins to block urine flow by compressing the urethra, physical symptoms can arise. Patients may have pain and difficulty when urinating as well as the more uncommon symptom of blood in urine. Known as pyelonephritis, a kidney infection can develop from a urinary tract infection. It is present when harmful bacteria spreads from your urethra or bladder. It’s a potentially life-threatening condition if left untreated, and patients can expect severe pain, fever, burning sensation when urinating, and blood in urine. Two common disorders, sickle cell anemia and Alport syndrome, can cause blood in urine. Sickle cell anemia affects more than 100,000 Americans and Alport affects one in every 50,000 newborns worldwide. Both cases may offer gross and microscopic hematuria. 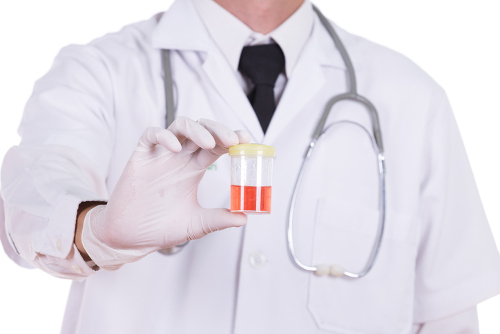 You may have kidney disease, known as glomerulonephritis, if lab tests detect traces of blood in urine. It causes inflammation within the kidney and can stem from infections, immune system disorders, or diabetes. Visible symptoms can include shortness of breath, swelling of ankles, vomiting, and overall weakness. Blood in urine can be linked to the type of medication you are prescribed for a health problem. Cancer drugs, penicillin, aspirin, and blood thinners can give your urine a red or brownish hue. 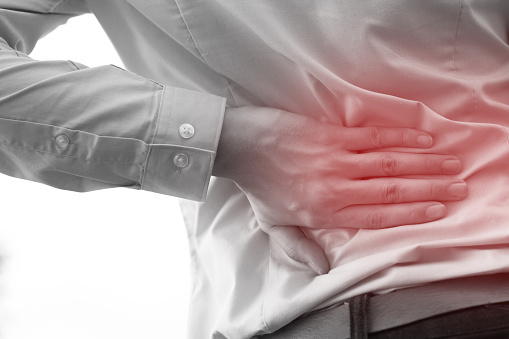 An accident or sports injury can damage one or both of your kidneys. An injury can also be caused by too much protein in your bloodstream from dehydration or by a serious infection. Certain medications can damage your kidneys over time. Blood in urine can usually be seen in most cases. Cancer is the first thought of many when encountering blood in urine. Blood in urine is often present when an existing cancer of the bladder, kidneys, or the prostate gland is in the advanced stage. Blood in urine, for whatever reason, can affect you in childhood, adulthood, and even once you become elderly. Several factors increase your risk of this symptom. A family history of kidney issues such as kidney stones or kidney disease can increase the chances of you experiencing blood in urine. While anyone at any age can have blood in urine present, men over the age of 50 are at a higher risk due in part to the natural growth of the prostate gland. Any infection in the body may cause inflammation of the kidneys, which in turn can cause blood in urine, especially in children. Young males are susceptible to kidney stones and Alport syndrome, both of which cause blood to appear in the urine. For women, more than 50% will experience a urinary tract infection with blood in urine being a common symptom. While discovering blood in your urine should be taken seriously, there is no great need to panic. Consider your lifestyle, diet, and medications before allowing your mind to worry. Blood or blood clots in urine can be treated only by diagnosing and directly treating the underlying cause. As blood in urine is a symptom, it is important to seek medical advice, and any sign of blood more than once should be checked out. “Blood in Urine (Hematuria),” Mayo Clinic; http://www.mayoclinic.org/diseases-conditions/blood-in-urine/basics/definition/con-20032338, last accessed February 15, 2017. “Urine – Bloody,” University of Maryland Medical Center; http://umm.edu/health/medical/ency/articles/urine-bloody, last accessed February 15, 2017. “Alport Syndrome,” Wikipedia; https://en.wikipedia.org/wiki/Alport_syndrome, last accessed February 15, 2017.